In this design, a small number of computers are designated as centralized servers and given the task of providing services to a larger number of user machines called clients. The servers are usually powerful computers with a lot of memory and storage space, and fast network connections. The clients are typically smaller, regular computers like PCs, optimized for human use. The term client/server also frequently refers to protocols and software, which are designed with matching, complementary components. Usually, server software runs on server hardware, and client software is used on client computers that connect to those servers. 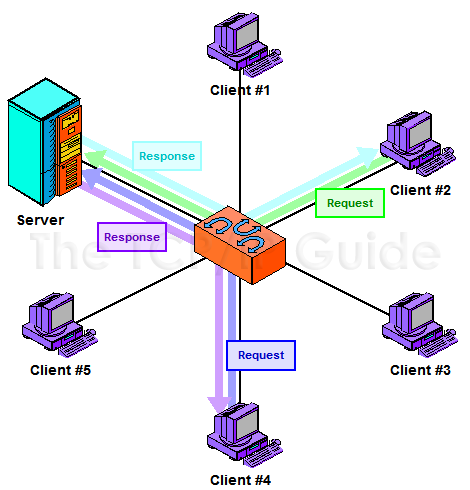 Most of the interaction on the network is between client and server, and not between clients, as shown in Figure 6. Server software is designed to efficiently respond to requests, while client software provides the interface to the human users of the network. In the client/server model, a small number of devices are designated as servers and equipped with special hardware and software that allows them to more efficiently interact simultaneously with multiple client machines. While the clients can still interact with each other, most of the time they send requests of various sorts to the server, and the server sends back responses to them. Contrast this to the peer-to-peer networking example in Figure 5. Key Concept: Networks are usually configured to share resources using one of two basic structural models. In a peer-to-peer network, each device is an equal and none are assigned particular jobs. In a client/server network, however, devices are assigned particular rolesa small number of powerful computers are set up as servers and respond to requests from the other devices, which are clients. Client/server computing also refers to the interaction between complementary protocol elements and software programs, and is rising in popularity due to its prevalence in TCP/IP and Internet applications.